Alopecia areata is an autoimmune disease in which hair loss occurs in some or all areas of the body due to the body misrecognizing its own cells as a threat, and destroying them as a result. In this case, the ‘threatening’ cells are the body’s hair follicles. This condition mainly occurs on the scalp, with small bald patches appearing on usually one side of the head, but can spread to the scalp causing total baldness (Alopecia totalis), or the entire body (Alopecia universalis). This condition can occur at any age, but usually first develops in teenagers and children. Women and men are equally likely to get the disease, and there is no differentiation of susceptibility between races. When developed at an older age, symptoms are usually milder and last for shorter periods. With the common, milder cases, the symptoms of this disease will subside without requiring treatment. 50% of sufferers will recover after 1 year (with possible reoccurrences), while 10% will go on to develop alopecia totalis or alopecia universalis. The causes of this disease are both environmental and genetic. Alopecia is a polygenic disease, meaning that both parents must contribute a number of specific genes in order for a child to develop it. In identical twins, there is only a 55% chance that if one has the disease, the other will develop it too, and therefore resulting in the belief that Alopecia areata is not just caused by genetics, but environmental factors too. Traditional Chinese medicine however, states that alopecia is most commonly caused by kidney and liver dysfunction. 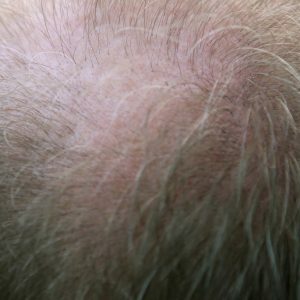 Scarring alopecia: Where there is extensive inflammation that does not subside, resulting to irreversible damage and loss of hair follicles (Rare form of this disease). 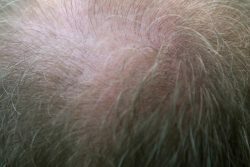 Non-scarring alopecia (Alopecia areata): Where the hair shafts have gone, but the hair follicles remain, resulting in the alopecia being reversible. There are not typically any tests that can be run to diagnose alopecia. The doctor will observe family history, degree and history of hair loss, and examine hairs from the affected area. Skin biopsies may be performed to rule out other conditions such as ringworm, and blood tests done to rule out other autoimmune diseases. Making a diagnosis of this condition is usually relatively straight forward due to the symptoms of alopecia areata being so distinctive.